Quality PC Training provides computer training classes in the Buffalo and Western New York area. Classes can be delivered at our beautiful training facility easily accessible from the New York State Thruway and Route 5, or onsite at your location. For more information call 716-400-7404 or contact us online. Looking for training for your entire team? 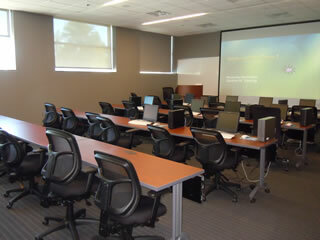 We can deliver any computer class onsite at your location or at our training center. We will be happy to customize classes to include the topics you want. Delivered at a time and location of your choosing. 1 hour round-trip travel time included. Customer must have proper facilities to host the event. A site survey may be suggested. Call 716-400-7404 or contact us online for more information. DisasterLAN (DLAN) - a state-of-the-art, web-based incident management system that provides information, workflow, and communication tools to help your team work as quickly and efficiently as possible. DLAN is accessible from all mobile devices; highly secure; fully IMS, ICS, and NIMS-compliant; IPAWS, CMAS, and MASAS interoperable. With DLAN at your fingertips, you'll be properly prepared to manage daily operations, emergencies, and everything in-between.